Honda rolled out a prototype of what will become the Type R, which for the uninitiated in the ways of Honda's globalized wackiness, a UK-built, hotrodded Civic. 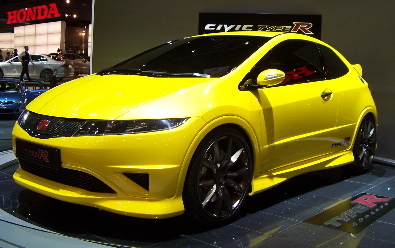 Powered by the corporate 2.0-liter DOHC i-VTEC four banger, producing 197 bhp (200 in metric), the Type R will likely get a full range of skirting and other such demonstrative accoutrements. Double kisses, all 'round, then.